BLDFROST - Goblin Wizard's Warband. It's a Fantasy Skirmish game from Osprey Publishing. 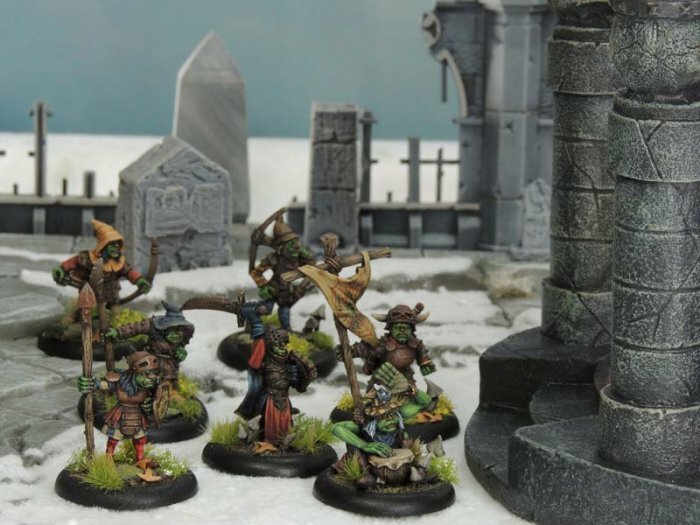 There are no Goblins in Frostgrave world, but many players are introducing their own take on the game. We thought we'd do the same, and offer a Wizards Warband made up of Borderlands Goblins. You get 10 figures. You'll get a wizard and apprentice, and 8 'Soldiers'. We'll make this up from Thugs, Archers, Men at Arms/ Infantryman and at least one Knight. Borderlands Goblins are 28mm sized metal figures, supplied unpainted. Figures shown in photo may not be the models you get in the Warband.